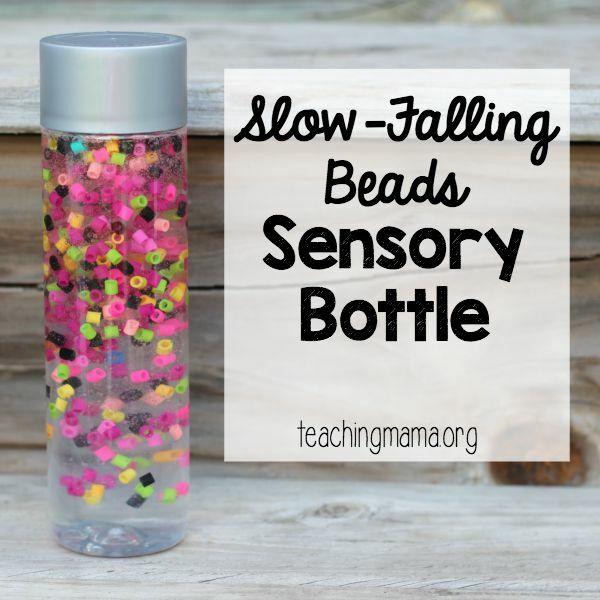 Today I’m sharing our sensory bottle of the month, which is our slow-falling beads sensory bottle. I had a hard time figuring out what to name this bottle, but I decided to name it ‘slow-falling’ because the substance inside makes the beads slowly move around the bottle. 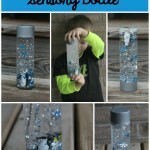 This is different than our other sensory bottles and I loved creating this one for my baby to play with! I have to admit that this was not my original idea. 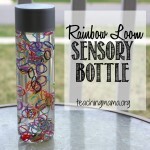 I first saw the idea for a suspended bead sensory bottle at Fun at Home with Kids and knew I had to try it out! Since I want to give credit to the original idea, you can pop over here to see the exact directions. We used a little more dish soap to make the beads move more quickly. 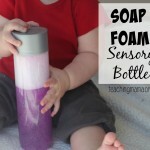 At first, I put too much hand soap in the bottle and they weren’t moving around very well. So I dumped some out and added in more dish soap. 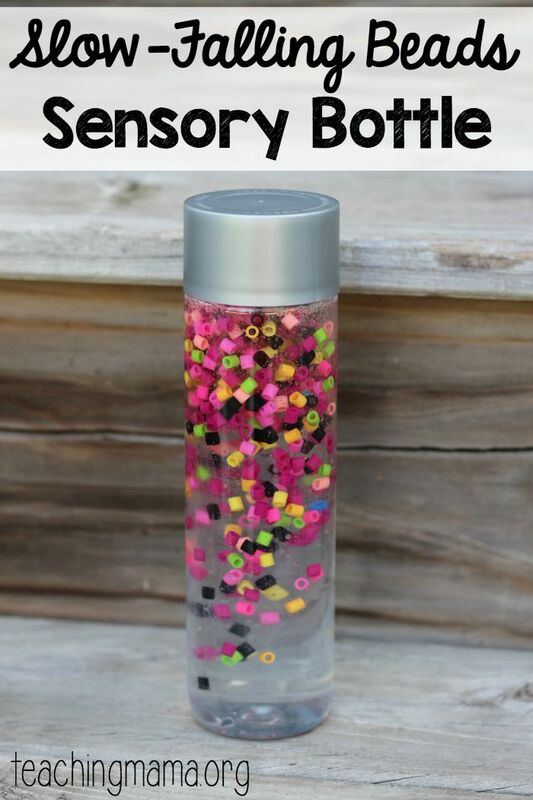 My other sensory bottles that I’ve made have liquid inside that made the objects move around quickly, so this one is different since we can watch the beads move around slowly. 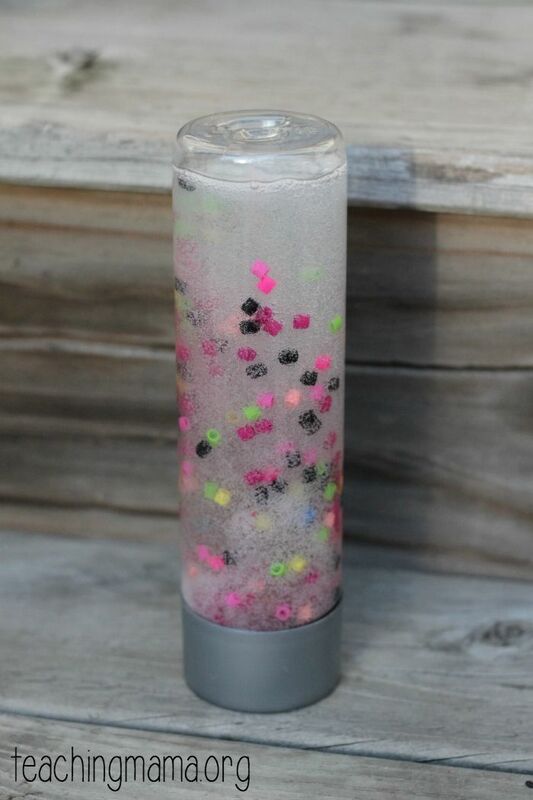 When you let it sit for a while, the beads float to the top and the bubbles fade away. Don’t forget to superglue the lid down so your little one won’t unscrew it! 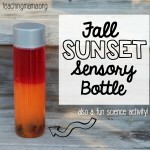 Hope you’ll try this sensory bottle out! 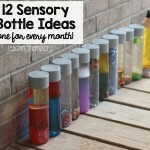 To see all of our sensory bottles, visit here. 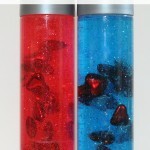 Have you tried the lava lamps? That’s done in the same fashion but with water, canola oil and food coloring ( a few drops ). Mixed in that order. Makes beautiful ocean like waves. I wonder if you can add those pearls too!?! Where do you get them? Thanks for your idea! Great idea! This could be adapted for people living with dementia also. 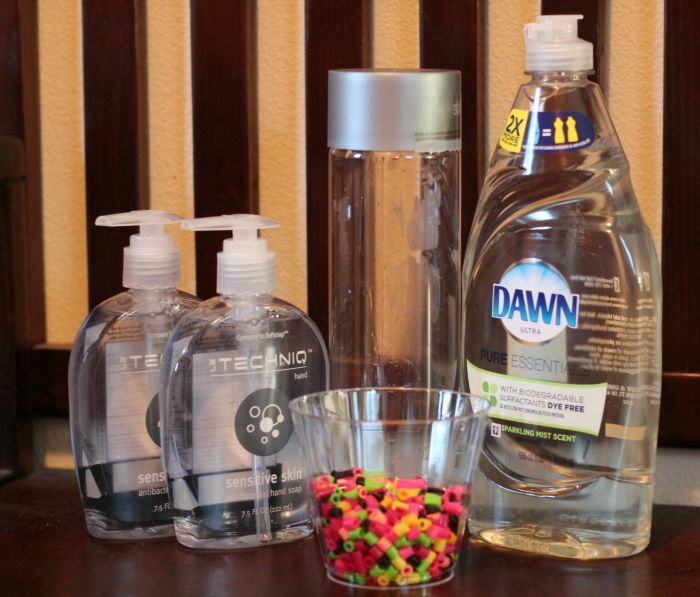 If you use corn syrup instead of soap (add water until you get the right viscosity for the objects), you won’t have problems with bubbles. Love this idea do you have those particular beads?or any other kind of beads? 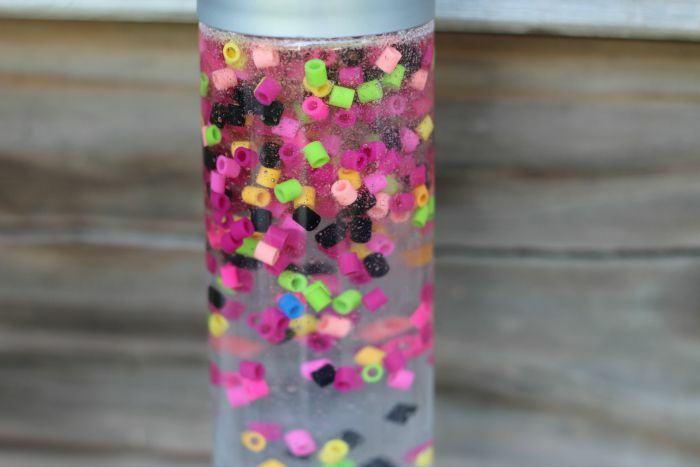 You can use any beads! Ok great. What are measurements for the soap? 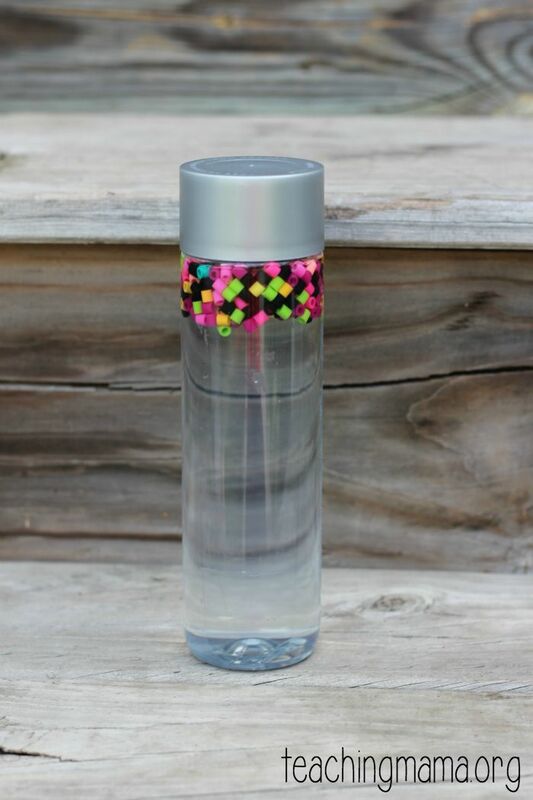 Can you tell me where you purchased your voss bottles from?? Sure! I got them from our local gas station. I’ve also found them at TJ Maxx (sometimes), Walgreens, and grocery stores. Or you can also try Amazon. Hope that helps! How did you get the lettering off of the bottles? This bottle had a sticker, so I just removed it by peeling it off. Sometimes it’s sticky and I wash it with warm water and soap. I got the beads from hobby lobby. Did you use water at all in this one?